Beautifully engraved certificate from the Rome, Watertown, and Ogdensburgh Rail Road Company issued in 1874. This historic document has an ornate border around it with vignettes of a train, two allegorical woman, and people watching Niagara Falls. This period cancelled certificate is hand signed by the company’s president ( Charles Parsons) and assistant-secretary and is over 131 years old. 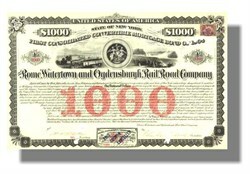 This bond was convertible into the company's Capital Stock if converted prior to July 1, 1879.